Add this shop to my favorites. Isles du Cap Verd Coste et Pays des Negres - Sanson c. Availability: in stock Condition : Very good, please study image carefully. 1680 Overall size : 30 x 21 cm. Image size : 28 x 20 cm. 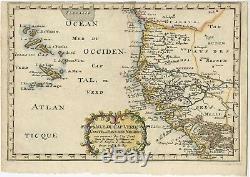 Description: Antique map Africa titled'Isles du Cap Verd Coste et Pays des Negres'. Antique map of the coast of Africa and the Cape Verde islands. Artists and Engravers: Nicholas Sanson d'Abbeville (1600 - 1667) and his descendents were important French cartographer's active through the 17th century. Sanson started his career as a historian where, it is said, he turned to cartography as a way to illustrate his historical studies. The item "Isles du Cap Verd Coste et Pays des Negres Sanson (c.
1680)" is in sale since Friday, November 2, 2018. This item is in the category "Antiques\Maps, Atlases & Globes\Africa Maps". The seller is "bartele-gallery" and is located in Langweer. This item can be shipped worldwide.